We will be re-stocking the stores now that Dragon Con is over. Claire has already updated her Claire Bear Bows Etsy shop. The two UpDown Studio stores will be updated very soon. Greg here… I’ve started a blog at thisisgregcarter.com to be a hub for all of my creations. Hop on over and see what’s going on. Claire has her own site as well, Sugary Planet. Ten Years of UpDown Studio! Looked it up and UpDownStudio.com has been online for 10 years as of January 26, 2012. Wow! I’ll publish a 10th Anniversary comic/art anthology if anyone wants to contribute? Also reprint anything we’ve done before. Also also get your comics on Graphicly. Just let me know who’s interested. Old/current/new members. Time for a resurgence of UpDown Studio! Check out ClaireBearBows on Etsy! Very cute stuff. If you’ll be at Dragon*Con check out the UpDown Studio table in the Comics and Pop Art Artist Alley. We’ll have a whole bunch more there. The UpDown Studio Shop is open! There’s still lots more stuff to come and it’s not quite 100% designed yet, but feel free to take it for a spin! Greg Carter and Elliot Dombo will be at MomoCon in Atlanta, Georgia this coming weekend March 12-13. 2011. We will have Love is in the Blood #1-3, Strawberry Death Cake #1, Perfect Agent #1-3, Worked to Death, buttons, t-shirts, and more. Inspired by songs of the working man, writer Greg Carter presents two tales of giving it your all. Emily Brady provides the art for “Cowboy”, showing that cattle drives of the 1800’s were not so different 2,000 years ago. 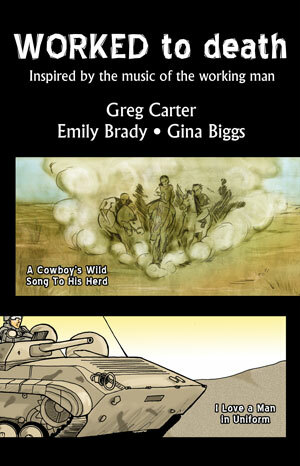 “Uniform”, with art by Gina Biggs, is the story of a soldier taking care of business by doing what he loves. Order a copy from IndyPlanet! Or save shipping and have your local comic shop order a copy from Haven Distributors. Give them the code WORDUPD001. And find out more about the full WORK! anthology HERE. UpDown Studio brings the comics! You want comics? We got comics! Follow the links below to read them free on the web.